When I first moved to Houston from northern California, the city surprised me in so many ways. It’s easier to be a vegetarian here than it was there, and y’all got great bourbon lists at your restaurants and bars! Especially at Poison Girl, host to one of the best reading series in town. 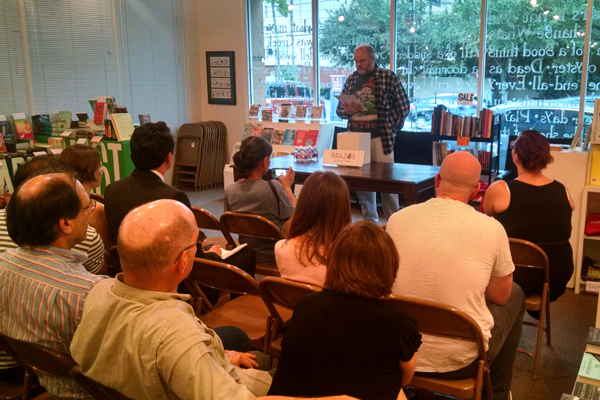 This was my favorite surprise: Houston’s vital, thriving, and progressive literary scene. But not everyone knows about the award-winning Poison Pen series, which runs the last Thursday of every month. 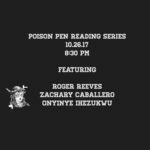 This month’s reading takes place on Thursday, October 26th, and will feature Roger Reeves, Onyinye Ihezukwu, and Zachary Caballero. It’s a decent crowd at Brazos Bookstore, on a Thursday evening in late July. Wine, beer, and water are on offer, and cheese and crackers. 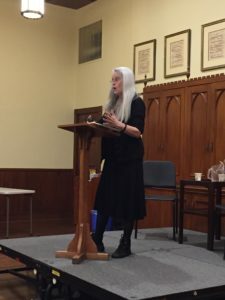 It’s festive, convivial, the usual gracious Brazos atmosphere for a reading—with the exception that we aren’t gathered to listen to a single visiting writer. Instead, unusually, we’re here to listen to each other. 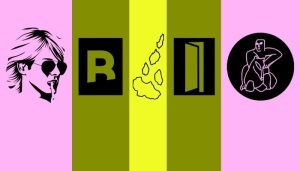 Brazos has graciously agreed to host a group reading by the members of Erika Jo Brown’s Inprint personal essay workshop. They’ve been meeting under Erika’s guidance for two months this summer to think about and experiment with the craft of this varied, extensive form, which (as Erika points out in her course description) can be both “intellectually rigorous and exploratory.” These folks are used to reading to each other, sharing and responding to each other’s work, and considering examples by selected essayists to help them think about such matters as “narrative arc, emotional ‘stakes,’ concretizing details, dialogue, point of view, characterization,” and more. They’ve been working, three hours a week for eight weeks at Inprint House. Now they’re going to take a big step outside the intimate confines of the workshop and strut their stuff publicly.